Klik! DockLib.Net for Windows Forms, part of Klik! Windows Forms Library, is a dockable layout management system to create next generation dockable window interfaces. It provides a complete modern replacement for tabbed MDI interfaces with great features such as docking/redocking and pinning. - A perfect full featured mimic of Visual Studio style docking mechanism. - Docking/Undocking windows with docking indicators. - Pinning dock items to container edges. - A complete layout serialization system to easily store/restore the current layout. - Ability to track and prevent any operation for any specific window such as docking, undocking, pinning, etc. - Ability to flash dock captions and headers to get attention of user to any part of the layout system when needed. Klik! 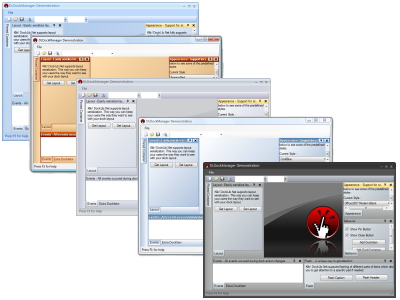 DockLib.Net shines when it comes to look and it provides you all modern themes included but not limited to Office 2007, Office 2003 and Visual Studio. It includes plenty of other custom predefined themes created by our professional design team which can be applied with a single click. Creating a dockable layout could not be that much fun and easy, thanks to next generation design-time experience provided by Klik! DockLib.Net. As a core share with other Klik! Windows Forms Library components, each component has it's own quick access menu associated with it which allows you to do many things with a single click such as adding new dock containers, new dock items and removing them. There is also a design-time version of our docking engine where you can simply dock/redock any dockcontainer or dockitem within the design surface just as you can do in run-time. One of the key features in Klik! 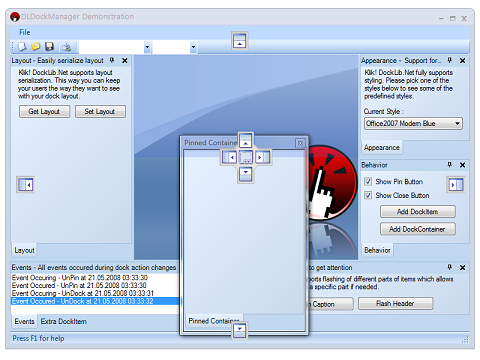 DockLib.Net for Windows Forms is the Style Management feature. When we say style, we mean nearly every visual aspect of a control including it's background, borders, backgroundimage, foregroundimage and/or other visual parts of a control can be easily changed both at design-time and run-time. The best way to see what our products does is to download and evaluate a trial version. Please click here to get the trial version of Klik! DockLib.Net v1.0 for Windows Forms. A Murphy rule says that no application can be bugfree! :) Please click here to get the latest update pack for Klik! DockLib.Net v1.0 for Windows Forms.